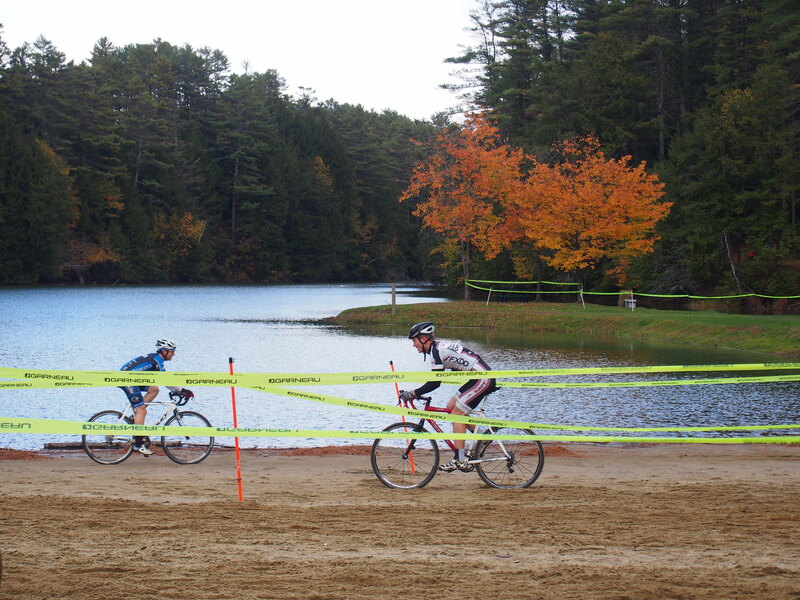 The Eastern Collegiate Cycling Conference’s Cyclocross (ECCC:CX) season spans close to two months in the fall of every year: from mid-October until early December. This year’s collegiate CX calendar was very similar to the previous one: It started with two races in New Hampshire (Hanover CX and Pumpkincross), followed by HPCX in New Jersey (hasn’t been a collegiate race in a few years); then NohoCX (formerly CSI); then the Supercross Cup in Suffern, New York (with a new venue); then the Thanksgiving weekend race in Fitchburg, MA; and, finally, the Eastern Collegiate Cyclocross Championships at NBX in Warwick, RI. The only thing after that was Nationals, which took place in convenient driving distance at Riverside Park in Hartford, CT.
MIT Cycling was represented at every single one of these races; mostly with only two riders (Julie and myself), but peaking with six eager souls on the final weekend of the season. Here is a short breakdown of the highlights of the season, which was dominated by warm and dry conditions (with a few exceptions). 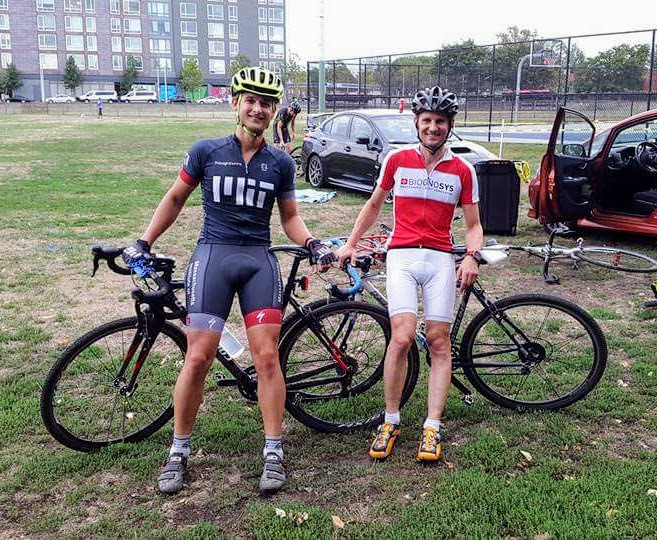 Late September, we welcomed some special visitors: Oliver and Claudia from Biognosys, one of our amazing sponsors, stopped by and Oliver joined me in participating in a Wednesday Night Super Prestige (WNSP) training race. 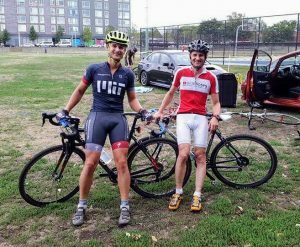 While some individual riders’ training plans may have started earlier in the year, the official kickoff for our team happened late September with two 3-hour long CX skills clinics lead by CX legend Adam Myerson (Cycle-Smart). 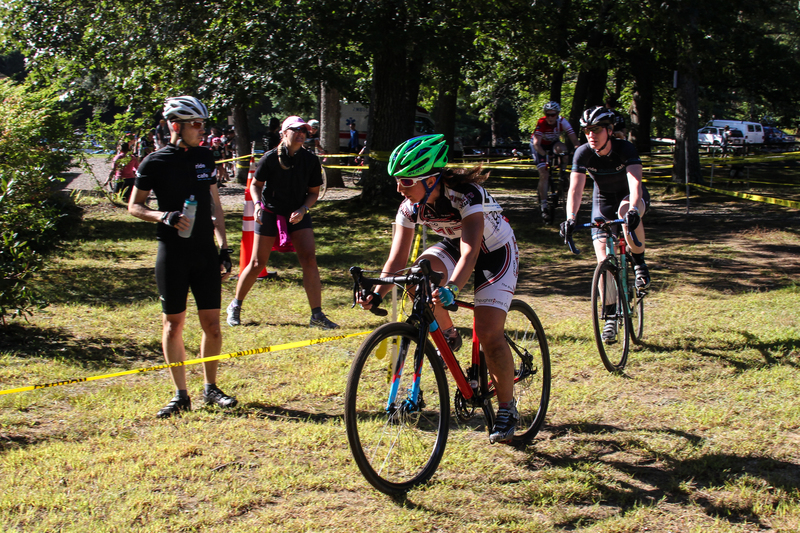 Cyclocross newcomers and veteran riders alike learned, unlearned, relearned, and tweaked skills ranging from dis- and remounts, to efficient carrying and shouldering, to choosing lines through corners, and cleanly riding off-camber turns. These clinics sent us well-prepared into the races: Julie, participating in the UCI/Elite races, raced herself to the top of the collegiate “Women’s A” podium in almost every single race; I competed in the collegiate “Men’s A” field for the first time and also consistently gathered points for the team (however, at a much smaller scale). Dmitro and Emma earned points on two race weekends. 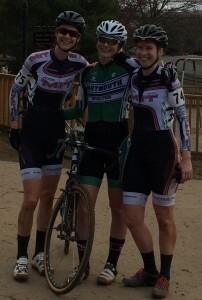 And Kate and Laura celebrated their CX debut with great results in the final two races. Supercross Cup in Suffern, NY: This race took place at a new venue this year (Rockland Community College). First impression: Very wide and hilly course, with some very fast descents, a lot of off-camber sections, and lots and lots of climbing. What made this race particularly special was the weather: On Saturday we raced in dry conditions with temperatures around 70 degrees. The course, which was mostly on grass, was fast and best suited to good climbers. Sunday’s race on the other hand was on the same course, but mostly reversed – this includes the weather. The conditions couldn’t have been more different to Saturday’s: temperatures had dropped to around freezing over night and it had rained and snowed (and kept snowing lightly on and off during the day), the course very quickly turned into a crazy mud-fest. 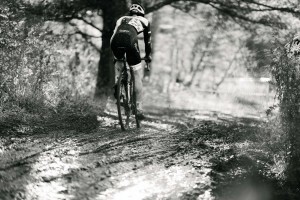 It was cold, muddy, windy, and wet – simply put: just beautiful! 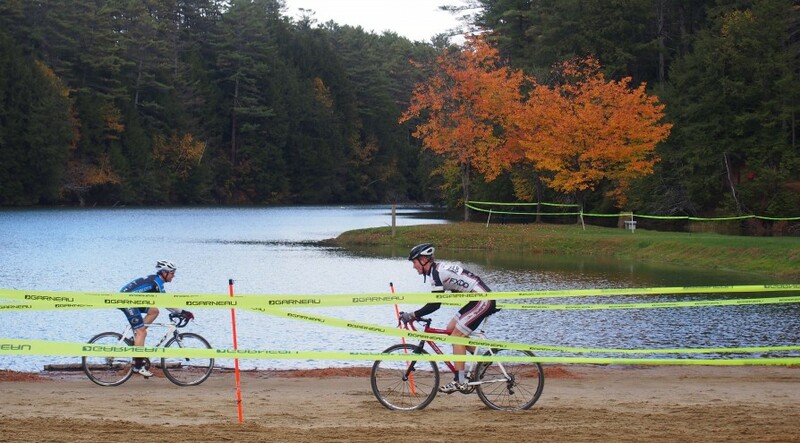 Due to setup of the course, completely new challenges emerged: long sections of off-camber were not rideable due to the slippery mud; lines kept disappearing in he mud from one lap to the next; lines weren’t accessible due to course tape blowing into the course; long run-ups and deep muddy straights turned into a fitness challenge. Great race! Let’s hope the venue allows the race to come back next year! 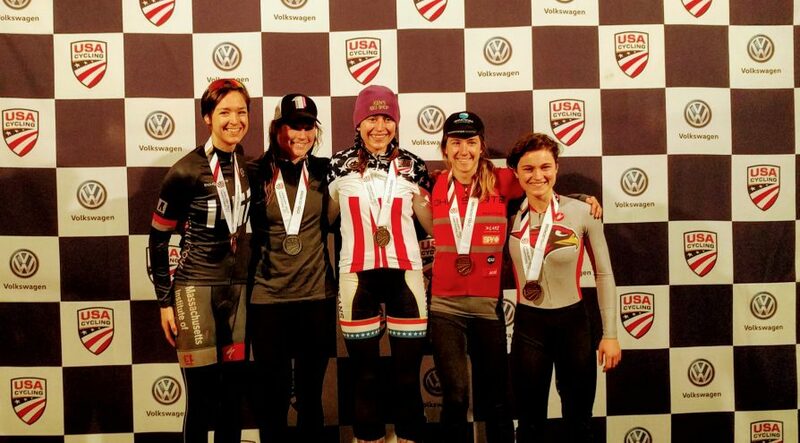 Julie was able to heroically take the Collegiate Women’s A podium on both days. I ended up 15th (Sat.) and 16th (Sun.) in the Men’s A field. 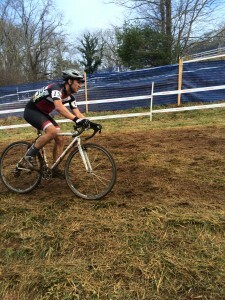 NBX / ECCC:CX Easterns: As mentioned earlier, we had six racers participating in this final race weekend. 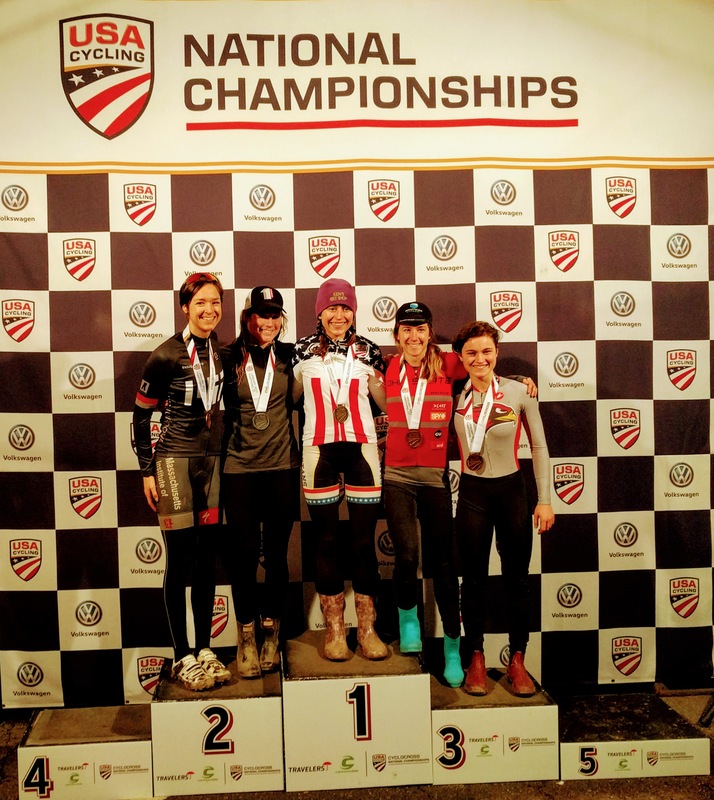 In addition to the usual CX-squad, this included two CX-newcomers (but experienced MTBers), Laura and Kate, as well as two racers who attended the NohoCX race as well, Dmitro and Emma. 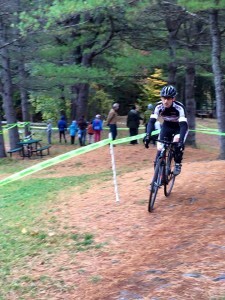 Laura (first CX race!) and Dmitro shredded the course on their mountainbikes, passing other riders on many rooty technical sections of the course. 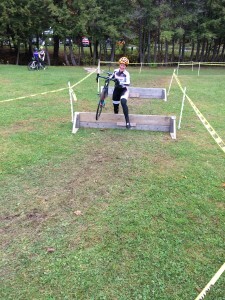 Kate, starting from the very back (first CX race! 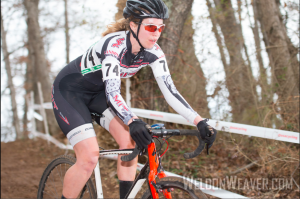 ), rode to the top of the Collegiate Women’s B podium on day one; a mechanical in the final lap of Sunday’s race moved her back to place four in Collegiate Women’s B of the day. 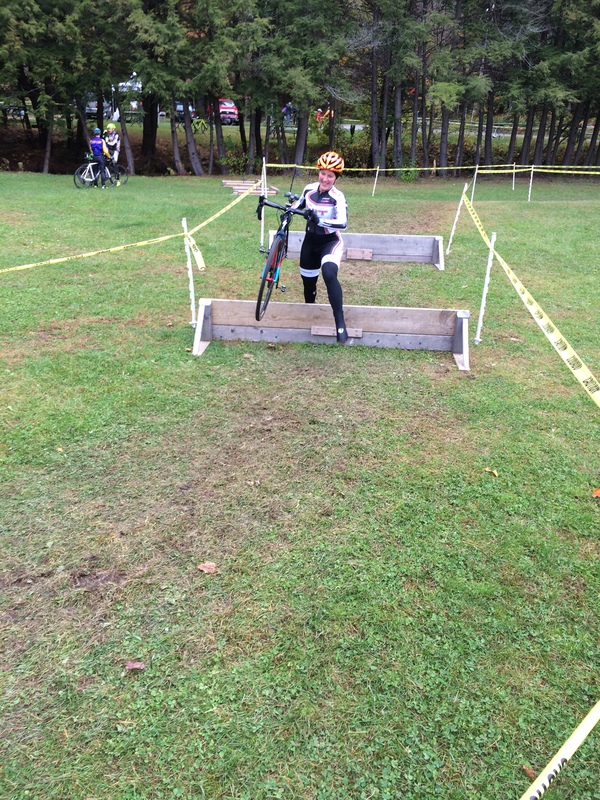 Emma raced herself to the top of the podium in both her races. And finally, Julie earned 1st (Sat.) and 2nd (Sun.) 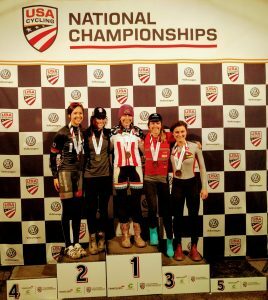 of the Collegiate Women’s A podium. 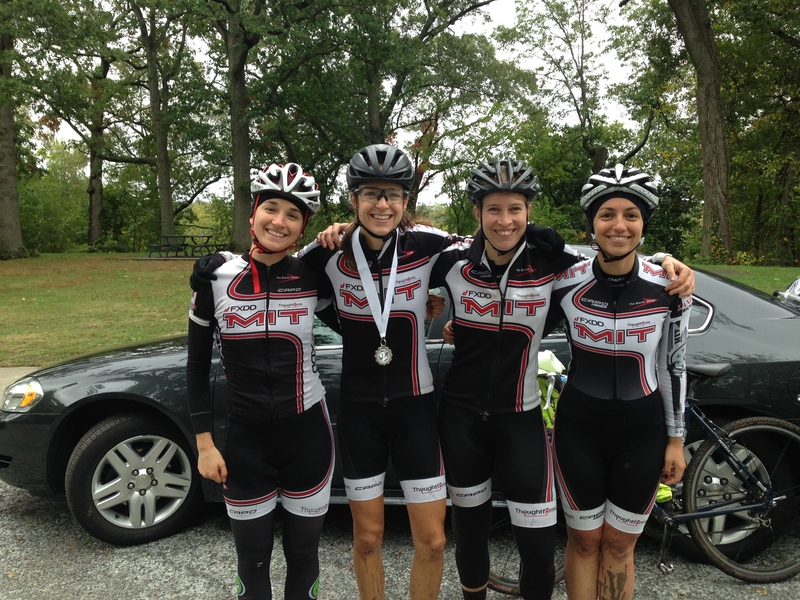 2) MIT Cycling ended up 3rd in the combined omnium of this season. This is a particularly great result considering that (a) the team was represented by only two racers for most of the race calendar (with Julie accumulating the majority of the points) and (b) the top spots on the podium being taken by much larger teams with high attendance throughout the season. “What about Nationals?“, I hear you ask. “Incredible” is my one-word answer. Heavy rain all of Tuesday quickly turned all grass on the course into slushy and wet mud. A steep downhill section became a spectator-friendly slip-and-slide extravaganza. Wednesday morning (our race day! ), the rain had stopped and temperatures had risen to close to 50 degrees; Tuesday’s wet mud had turned into deep and sticky mud that clung to every part on your bike, especially parts that you didn’t want it to stick to: pedals, rim brakes, and drive trains. Many sections became unrideable for mortals like me; yet carrying a bike weighing three times its normal weight didn’t make these sections much easier. For obvious reasons, riders having the luxury of a pit-bike switched bikes twice a lap, thereby avoiding two long muddy sections of the course by riding through the double-entrance pitand collecting a clean bike as reward for this smart choice. Due to these challenges the race organizers cut a few sections of the course during the day to avoid short 2-lap races in the later part of the day. On Thursday, things were different again: Temperatures had dropped well below freezing and all the ruts in the muddy ground had frozen overnight. These ruts made for a bumpy ride and riders had to be careful to keep their front wheels out of trouble. Needless to say, many riders flatted, and many more were sent to the ground. 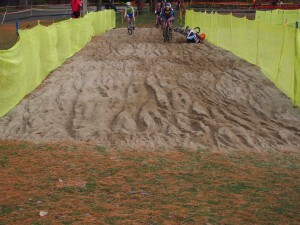 On the bright side, lap times were much faster again; so previously removed sections of the course were added back in. Friday’s conditions were similar to Thursday’s, but a bit colder. On Saturday, snow built up on the course over the course of the day. And Sunday, the elite riders had to battle a generally abused and frozen course, topped with ice, snow, and a bit of mud here and there. Again, pretty much everyone had expected challenging conditions, but nobody expected that the challenges would be different ones every single day. Kudos to the organizers! Julie’s and my race took place on Wednesday in the muddiest of conditions. After my race (43rd – mud mud mud, and challenges as described above — what more can I say? ), I had my first experience being part of a pit-crew. Julie had a great start and stayed in the top 5 for the entire race. We made sure she could switch to a shiny mud-free bike every half lap and she was able to round out her career as an MIT Cycling racer by finishing fourth in her race. In the Nationals Omnium, MIT Cycling took place 14 out of 38 schools attending (bear in mind we only had two racers attending). What now? 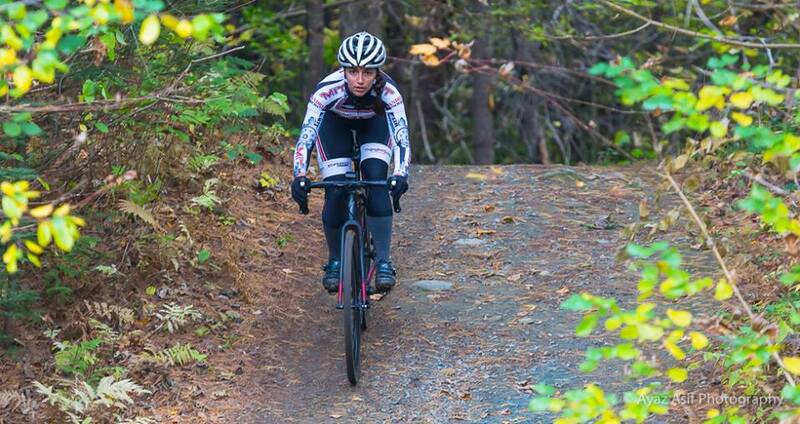 MIT Cycl(ocross)ing will be training until the leaves start falling and the days get shorter again. Hope to see you at some races in the fall! Tobi after Supercross Day 2. I’ve written this blog post about five different times. 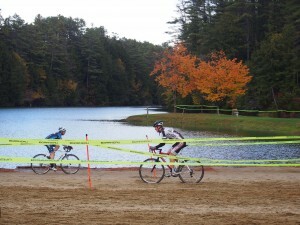 Sometimes I wrote the post to focus on the race or the course (or its features). Other times, I focused on the food (hello, it’s Asheville). Biscuit head jam bar. Yes, jam bar. Go to Biscuit Head. You’ll thank me. 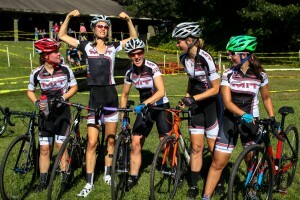 I was among friends and family: we spend a lot of time on our bikes together, and I’m happy to love the people that I race with (and oftentimes against). We stayed in a house with other ECCC racers from Dartmouth, Harvard, and Wentworth, many of whom were also teammates on Green Line Velo. It was fantastic to travel together, cook together, hang out together, and support each other from the sidelines and at home. It was Colin’s first time at Nationals! 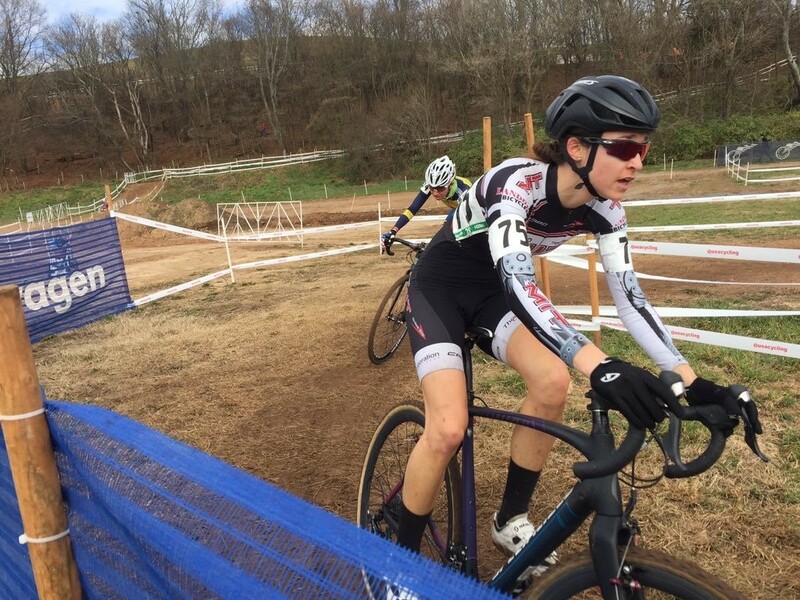 My parents also came to watch; right after seeing their first cyclocross races at Canadian Nationals in October, they asked “so… when’s Asheville?” I also loved seeing so many friendly and familiar faces – the NECX has an amazing community. Team dog – always a good idea. I accomplished some goals. 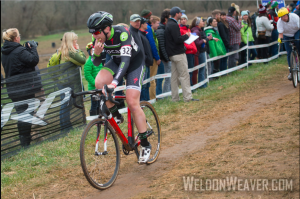 Nationals marked the culmination of my season where I’d set big goals and accomplished them. I’d set out to go race at Canadian Nationals, finish the ECCC season as the series leader, and finish top 5 at Collegiate Nationals. Though I didn’t think I could do it at times during the race (even Richard Fries announced “Julie van der Hoop – today might not be her day”), I came back from having dropped from 4th to 9th in the second lap. With one lap to go, I was on the wheel of 5th place. I passed her over the barriers and went hard. The gap just opened from there. I crossed the finish line smiling. I saw Corey at the finish line waiting for me, gave her a hug, and cried. After the D2 Collegiate Women’s Race. Thanks, mom. I had fun. With all the goals I set this season, it was easy to forget why we do this in the first place – it’s challenging, it’s strange, and it’s just plain fun. It’s nice to be able to laugh at yourself (especially in situations like these). The charity donut race for the iDream Athletes Foundation was a fantastic opportunity to celebrate the end of the season. AJ Moran has been training all season for this. I haven’t eaten five donuts in a week in my life, let alone in 17 minutes while racing four laps of a shortened course. Corey and I, along with our Green Line Velo teammate AJ Moran, had an absolute blast. We did it for the kids, you know? Since nationals I’ve biked zero hours and eaten zero doughnuts. I’ve had two weeks to reflect on the trip, to retire that skinsuit (thank god for new kit) and to start thinking about the upcoming ECCC road season. What goals will I set? Who will we travel with? How much fun will we have? And of course, where will we eat in Asheville at Road Nats in May? #priorities. This ‘cross season, we’ve had it all: dust and heat at GP Gloucester, flurries at Pumpkin Cross, mud at Supercross, and frost in Fitchburg. The last ECCC weekend is upon us – Dec 5 and 6 will be the Conference Championship held at the NBX Gran Prix of Cyclocross in Warwick, RI. MIT currently sits in 3rd place in Division II in the conference, head-to-head with Dartmouth but well behind Army’s solid lead. Heading into Easterns, MIT racers Tobias Ehrenberger and Alex Springer are in 4th and 5th in Men’s C and B divisions, respectively. Corey Tucker could crack the top 5 in Women’s B. Emma Edwards and Anne Raymond had great performances at the Cycle-Smart International weekend, putting them in first and second for Women’s C. And, here’s hoping Julie van der Hoop can take home the top spot in Women’s A. Here are some great photos of the team throughout the season. More mud at Supercross. There was a LOT. We could watch these for days. Wish us luck at Easterns, and as we prepare for Nationals in Asheville in January! The second collegiate race weekend, and one relatively close to Boston means we usually have a pretty good racer turnout. This year, there were six of us (five women and Tobi), and we witnessed the reemergence of our resident doctor (almost) doctor Morgan for her first race weekend in about a year. We had a broad range of racing categories represented which meant lots of racing to watch and lots of racers to cheer on throughout the day. This is mostly attributable to Julie racing her first UCI race ever and admirably making the most of a mechanical filled day 1 by taking a maple syrup hand up and getting her neutral bike really, really sticky. There were some awesome finishes too: Anne and Emma both taking top 10s in the women’s cat 4 race over the course of the two race days. Having all those friends cheering you on are what can make a race weekend fun…but what makes it great are the courses. The NoHo courses are impeccable. They are a perfect mix of challenging while not being terrifying. The courses at Providence are arguably the most intimidating, Hanover maybe the most technical, and the courses at NoHo are a terrific middle ground. Everything is rideable, unless they really intended for you not to ride it (still working on those barrier hopping skillz…), but parts definitely require some skill. 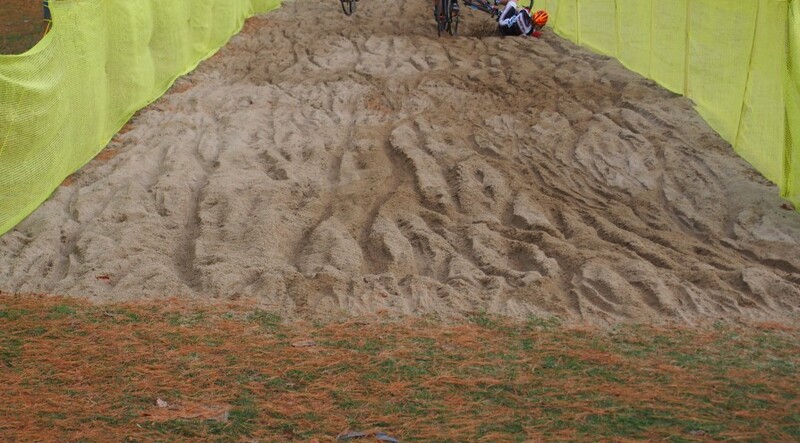 There’s a rough run up, a deep sand pit, some tricky off-cambers, and a pretty steep downhill pitch. There’s also lots of power riding. 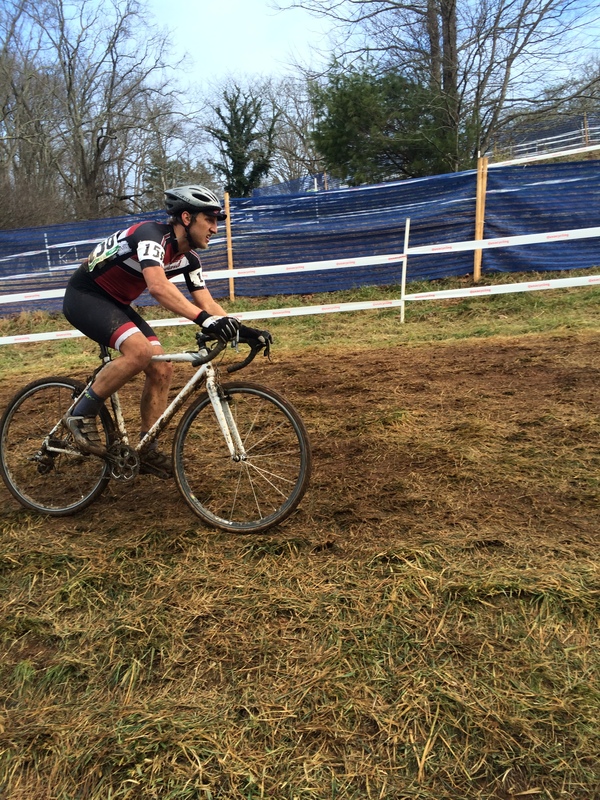 If you listed CX course requirements, NoHo’s got it…except for mud. Thank god. And finally, the intangibles. 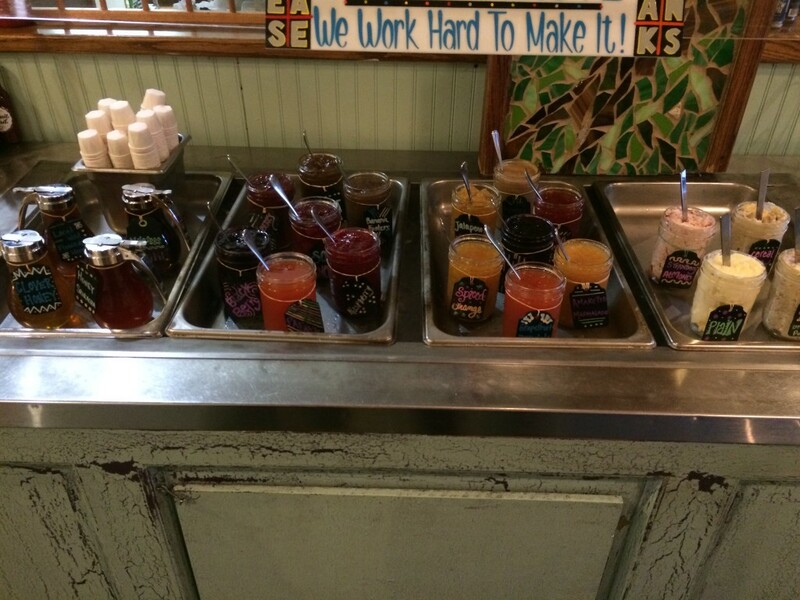 Those little things that can put a weekend over the top…things that you only get at special races and special venues. Awesome food trucks? Giant podium cookies? A really cool town to hang out in after the race? (I will refrain from an ode to Northampton, but it’s cool there, alright?) Microbrewery with a CX film festival? Check, check, check, and check. NoHo has it all. 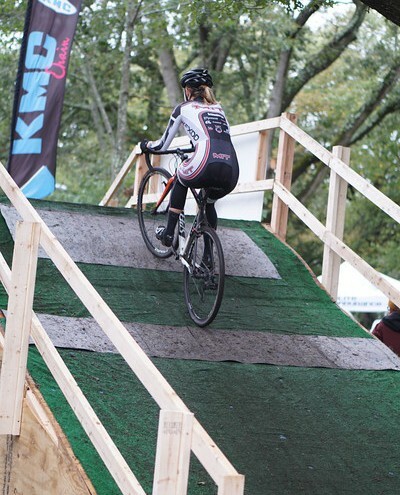 To get primed for the upcoming ECCC Cyclocross season, MIT racers hit up some of the biggest events in the National CX calendar over the last few weeks: the Grand Prix of Gloucester and the KMC Festival of Cyclocross in Providence, RI. A mix of veterans (and alum!) and first-time racers hit the difficult courses and with fantastic results. 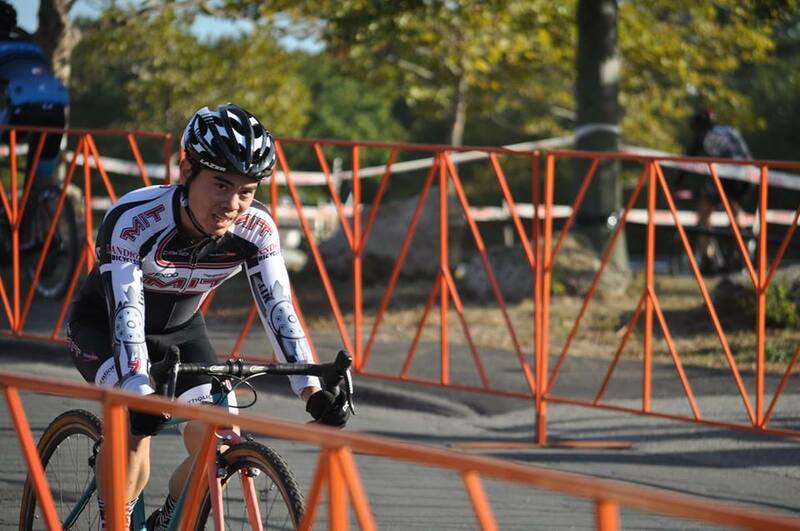 Matt Li comes through the paved section on Day 1 of GP Gloucester. Photo by Ernest Gagnon. 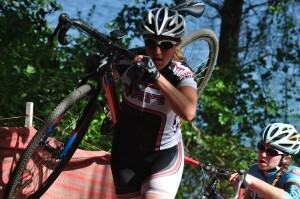 Anne Raymond faces the infamous GP Gloucester run up fresh with new skills from our clinics with Adam Myerson. Photo by Ernest Gagnon. Julie remounts after the barriers. Corey Tucker rides one of the many KMC flyovers. 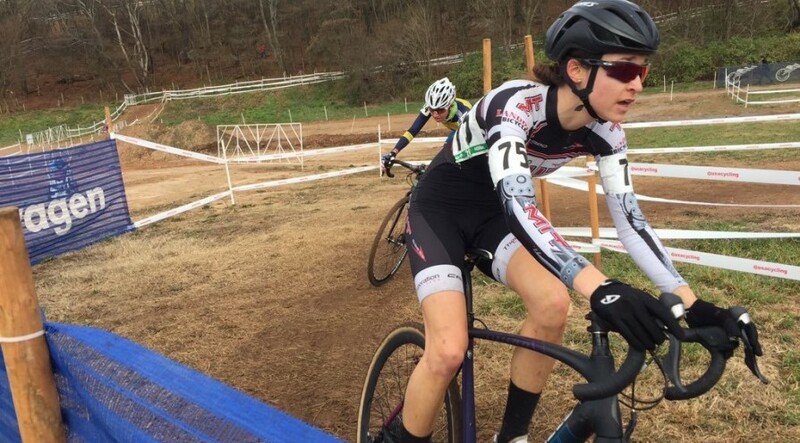 Emma Edwards’ first CX race was on one of the toughest courses that we’ll see this season. Congrats! The ECCC Season is now upon us, and we couldn’t be more excited for what it’ll bring. If you’re in the area, stop by to cheer and spectate! 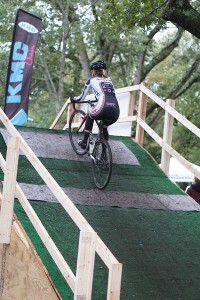 See the ECCC Cyclocross Calendar for more details. 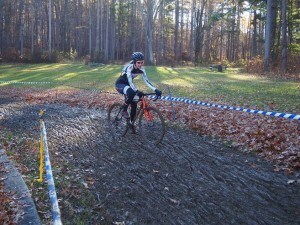 Somehow I got it into my head that I wanted to try cyclocross. I suppose all the stories about bacon and beer handups and ridiculous photos of people leaping onto bikes wearing cat leggings finally seeped into my brain. So I purchased a tiny black, red and blue Crux with sweet disc brakes and after a few frustrating and bruise-filled mornings in Danehy Park learned to mount and dismount the bike, and somehow stumble over the practice barriers. 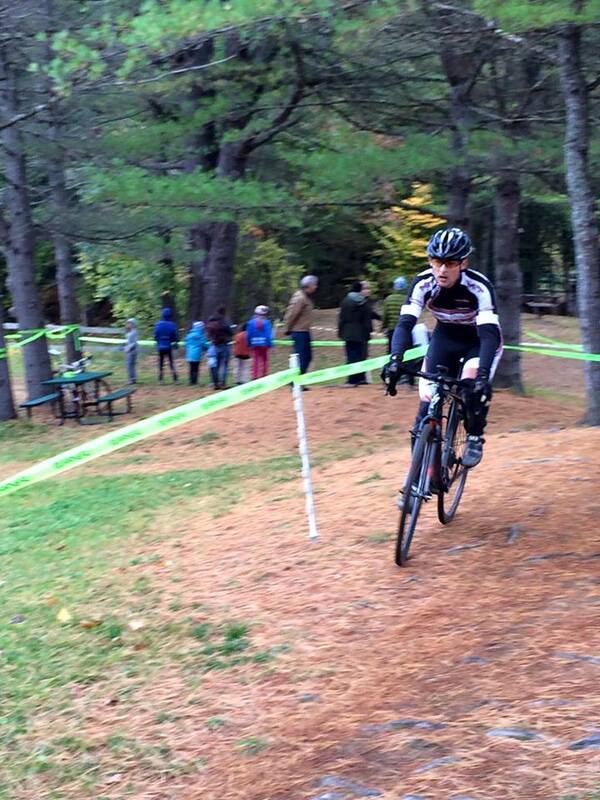 Naturally, after about two cumulative hours of ‘cross practice, I was already itching to race despite being woefully underprepared (the best training is racing! -JVDH). So off to Quadcross I went. I arrived on race morning to pre-ride the course with our captain Matt Li, who explained the best way to approach each section of the most technical course I had ever ridden (uhhh, where’s the pavement??). I was in turn both exhilarated and completely terrified at what I was about to do. 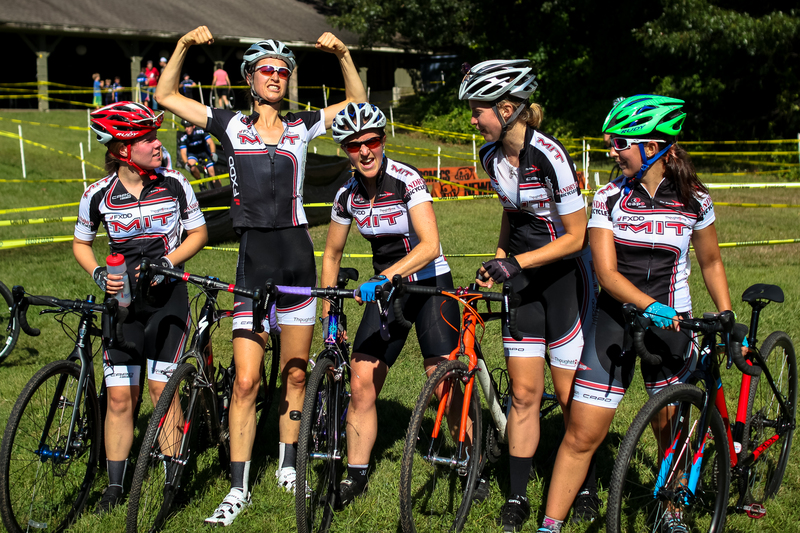 We were the first race to go off, and I lined up at staging with my four other MIT Women teammates, feeling excited and mentally focusing on two goals – don’t get hurt, and have some fun! 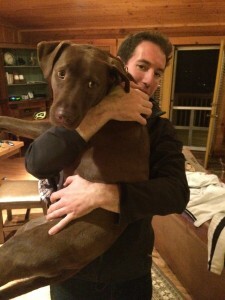 I am still nursing a shoulder injury from road season so I was especially concerned about the first one. Before I knew it the gun went off and we were sprinting down the chute into the first turn. 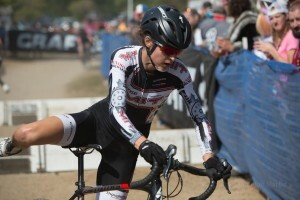 For anyone not familiar with ‘cross, the start is the most important for positioning yourself in the race, and is an all-out sprint and shoulder/elbow/hipcheck-fest. Since I was a n00b, I totally botched this part and managed to end up in last place because I dismounted on a hill and couldn’t clip back in. Meh. 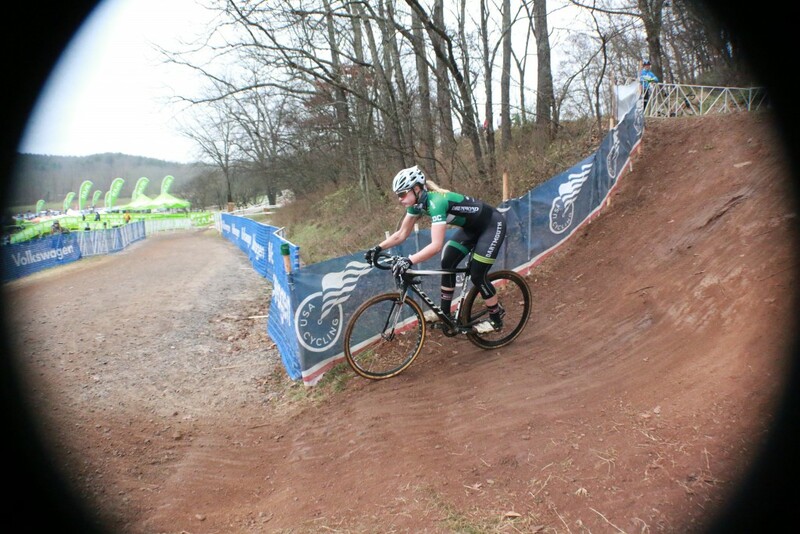 During the course of the race I was able to pass a few riders by motoring up the steepest parts of the course and staying upright in the tight, technical turns. The most difficult section by far was a sandpit containing 2 tight turns which I (VERY STUPIDLY and to the amusement of all watching) tried to ride, but which everyone else figured out was necessary to run through. I fell on the first two laps and then finally realized I had to dismount and run for the last two laps. I was able to complete the entire race without being lapped by the leaders and was incredibly proud to cross the finish line. 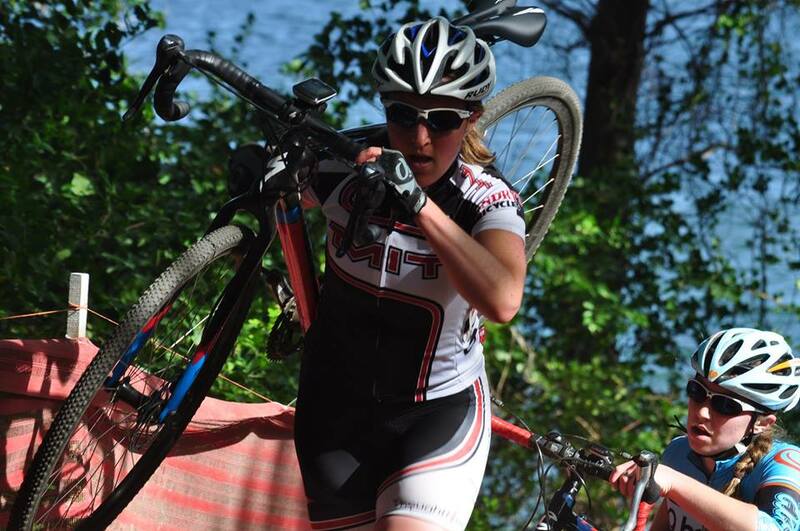 Cyclocross is a gut-wrenching, exhilarating, terrifying experience which pushes you to your limit both mentally and physically. I did things on my bike that I never thought I could do, and that was truly awesome. The spectators were incredible and the atmosphere friendly, plus there was ample food and adult beverages to enjoy. I learned more in that 40 minute race than I probably could have learned in hours of biking around in a park or on trails. 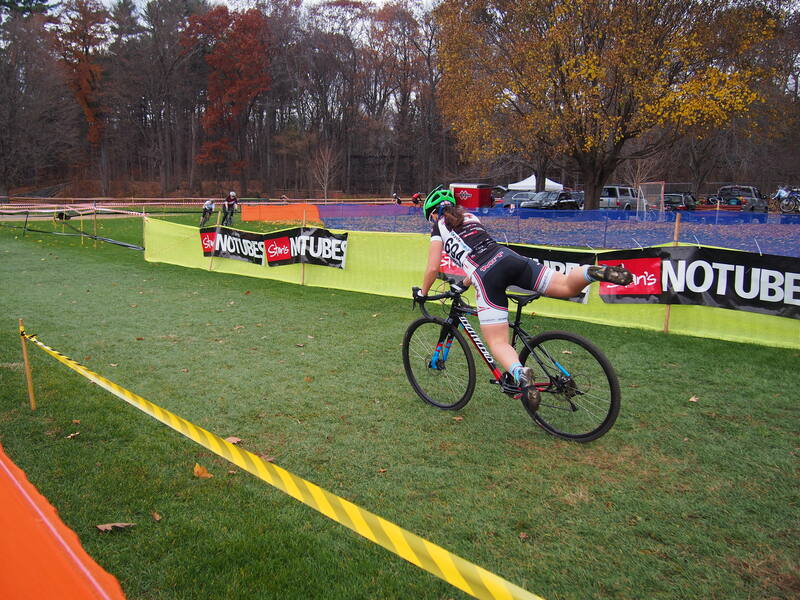 CX is something you have to experience firsthand… you can’t train for all the obstacles you’ll find in a race. 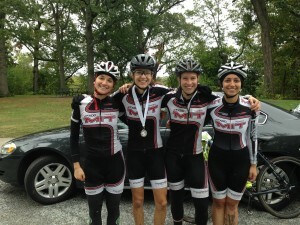 The ladies of MIT Cyclocross celebrate their finish at Quadcross! 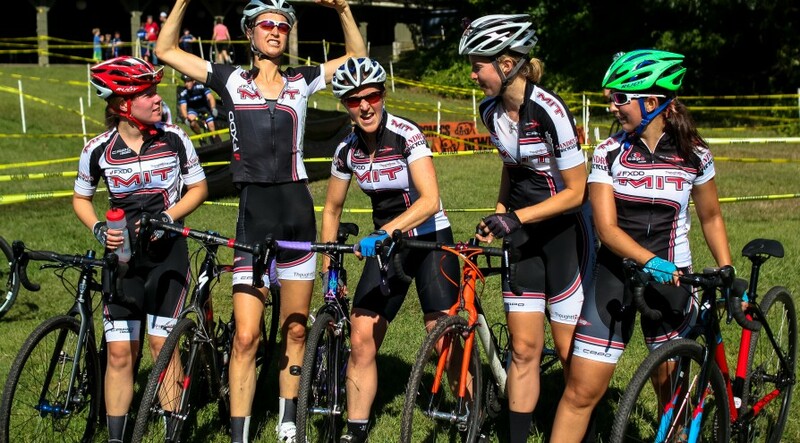 Finally, perhaps my favorite part of the day was cheering on my teammates after my own race was finished – CX is a really, really fun spectator sport! 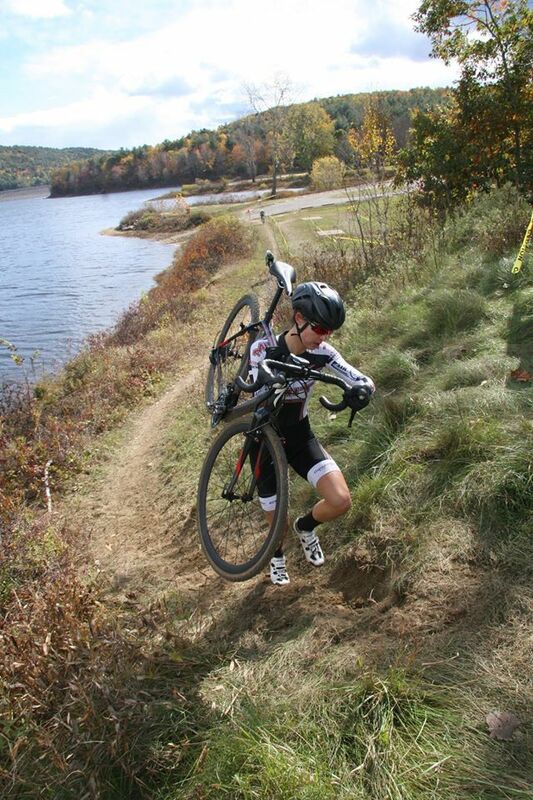 If you can’t tell, I’m already hooked and signed up for my next race, Rapha SuperCross in Gloucester, MA! 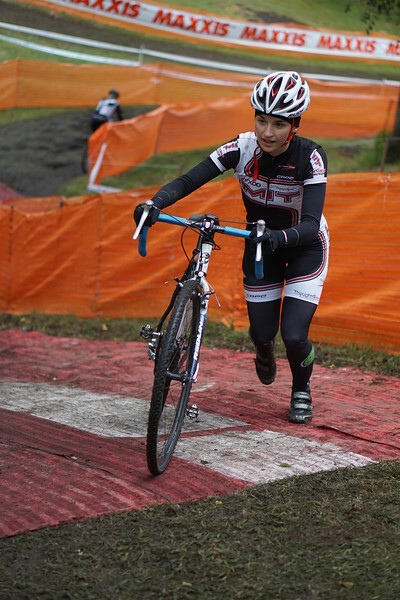 I definitely recommend checking out a ‘cross race – I guarantee you’ll have a fun time, whether you race or not! 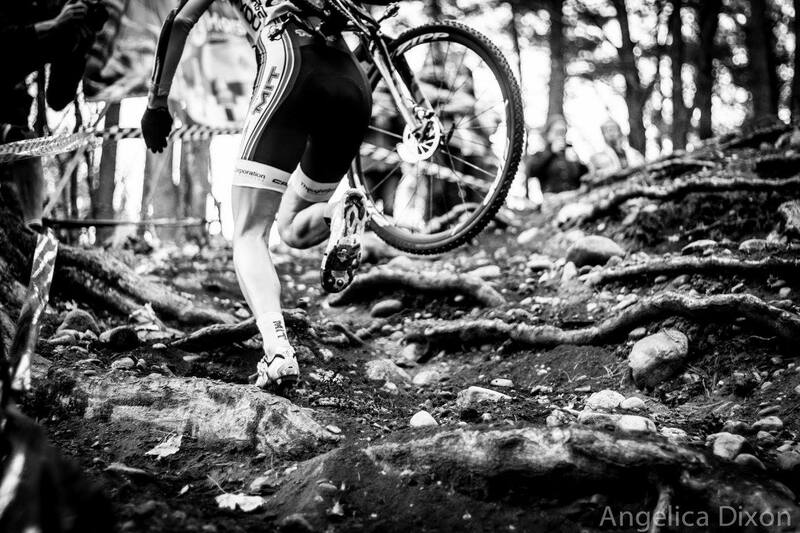 It’s August, which means that cyclocross season is just around the corner! For the true diehards, the first local race is August 24th in Springfield. For traditionalists like myself, the season doesn’t really start until mid-September. 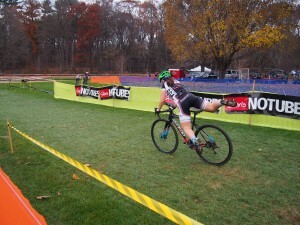 Either way, August is a good time to start practicing your cyclocross technique. I’ll try to give a few tips in this email, and we’ll run some clinics once school starts. If there’s anything in particular you’d like to improve on, please drop me a line and we’ll tailor the clinics accordingly. 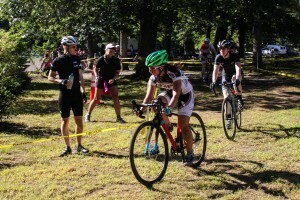 A few people have expressed interest in trying cyclocross this fall, but don’t yet have a bike, so I thought I’d devote this month’s newsletter to equipment. First, though, a quick reminder of the training objectives for July. According to the schedule I mailed out last time, we’re currently ending Week 1 of the Base 2 phase. Your main focus should still be on aerobic development, with at least three zone 2 rides per week. Your second objective is to start easing yourself into harder efforts. Start with one tempo workout per week, riding at 85-95% of your time trial heart rate for extended periods without interruption. Start with 20 or 30 minutes and add 5 or 10 minutes per week. The third objective for Base 2 is to start to get your legs accustomed to working at different cadences. You may not realize it, but on the road you generally pedal within a very narrow range of your preferred cadence, unless going up or down a steep incline. A cyclocross course, on the other hand, changes terrain quite rapidly, often faster than you can shift, so it’s important to be able to deliver power over a wide range of cadences. Spinning at high cadence requires pedaling efficiency whereas a low cadence requires strength. To develop the former, try to incorporate some spinning intervals into one or two of your aerobic rides. Shift into a low gear that will enable you to spin 10 or 20 RPM above your preferred cadence, and hold it for five minutes. Recover for five minutes at your normal cadence, and repeat. To develop leg strength, your fifth workout of the week should incorporate hill-climbing that requires you to drop your cadence 10 to 20 RPM below your preferred cadence. Some good local climbs include Eastern Ave in Arlington, Prospect Hill in Waltham, or Great Blue Hill in Milton. Start with three 3-minute intervals and build from there. Exercise caution when doing strength workouts as it is possible to overdo it and injure yourself. If you’re in your first or second year of cycling, skip the strength workouts and do a fourth day of aerobic riding instead. Finals are over, days are long, the weather’s great, all of which suggest it’s time to start base training for cyclocross! The ECCC schedule will likely run from November 1st (the first Saturday after Mt. Bike Nationals) to December 7th (the Sunday before ‘Cross Nationals). In this email I’ll lay out a general training philosophy, based largely upon Joe Friel’s methods but with some cross-specific adjustments. Additional references are listed at the end. This schedule assumes that ‘cross is your primary focus, but the sport can also be good preparation for road season or just a way to keep the winter weight off.